The ASEAN Climate Resilience Network (ASEAN-CRN) participated in the 5th Asia-Pacific Climate Change Adaptation Forum with the theme “Adapting and Living under 2C: Bridging Gaps in Policy and Practice”, which was held at the Bandaranaike Memorial International Conference Hall (BMICH) on October 17-19, 2016 in Colombo, Sri Lanka. The forum, the flagship event of the Asia Pacific Adaptation Network (APAN), is the primary regional platform for adaptation practitioners to meet, share their learning and experiences, and work together towards the pertinent outcomes and practical solutions that are needed to address the challenges of climate change. It has brought together policymakers, scientists, donors, youth, and representatives from over 50 countries to explore platforms and concrete pathways for even greater partnerships by governments, civil society and business. 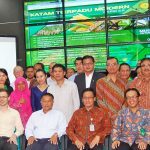 The forum covered a diverse set of topics and were oganized under four major streams: adaptation planning, financing for adaptation, climate resilient development, and multi-actor cross learning. 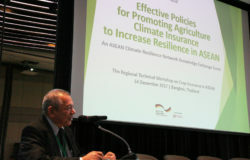 The ASEAN-CRN, a platform for regional cooperation to promote resilience to climate change in the agricultural sector of ASEAN, which is being supported by the ASEAN-German Programme on Response to Climate Change, Agriculture and Forestry (GAP-CC) and implemented by the Deutsche Gesellschaft für Internationale Zusammenarbeit (GIZ) GmbH, has organized two sessions in the forum under the multi-actor cross learning stream, namely: (1) Effective multi-actor collaboration in advancing climate smart agriculture in the region, and (2) Promoting ASEAN Agriculture under the Paris Agreement. The moderator and panelists on the session “Effective multi-actor collaboration in advancing climate smart agriculture in the region”. In the first session co-organized with Sure-Co – and joined by panelists from the ASEAN-CRN, Indonesia Ministry of Development Planning, Sri Lanka Department of Agriculture, Overseas Development Institute, and the Asian Development Bank – the importance of knowing the key drivers and top actors to ensure an effective multi-actor collaboration has been emphasized. Key drivers should include collective action; socio-cultural norms and values of the stakeholders, particularly farmers; and agenda of development finance institutions that are also in line with the advocacy of the collaborating actors. Similarly, a multi-stakeholder approach is needed in such kind of collaboration, which should compose of policy makers, private sector, research and development institutions, agriculture universities and extension services, as well as farmer leaders and organizations from the community. The other session on promoting ASEAN agriculture under the Paris Agreement gave way for the panelists from the ASEAN-CRN, the ASEAN Social Forestry Network (ASFN), Food and Agriculture Organizaion (FAO) of the United Nations, and Caritas International to share the processes and ways forward of engaging in the United Nations Framework Convention on Climate Change (UNFCCC) as a region. 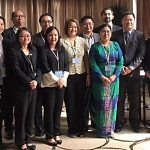 The ASEAN agriculture sector is a sleeping giant in the UNFCCC agenda and it wants to be factored in the international negotiations through the ASEAN Common Positions in Agriculture as a mechanism to progress issues related to the sector. Findings from the session highlighted that as agriculture is a highly contested and highly political space, there is a need for concrete workplans and commitments from the UNFCCC government frameworks in order to navigate in this space, also by linkaging with the environment and forestry sector in order that the agriculture moves forward to the negotiations.